Below is my “manifesto” on why I will no longer be voting as a Christian in America. This is where my conscience has led me after several years of praying, seeking God’s Word, and observing politics in the church. Again, these are MY biblical/personal reasons. This was not written to impose my beliefs upon you. But rather to share with you where I believe God is leading me. My vote seriously doesn’t matter. Daniel 2:21, Psalm 62:11, Romans 13:1. God is sovereign. The man/women whom He chooses up will get elected with or without my vote. And what if I vote for someone who doesn’t win? Am I not potentially voting against the will of God. #Yikes (bet you never thought of it that way) (Acts 5:38-39). There’s no such thing as a true democracy when you have a sovereign God. I see no place in scripture where Christians are commanded to vote. I’m commanded in scripture to pray for the leaders (1 Tim 2:1-4), be subject to governing authorities (Romans 13:1, 1 Peter 2:13-15), not resist government authorities (Romans 13:2), pay taxes (Romans 13:6-7, Matthew 22:21). There’s a difference between obeying/submitting to the government (as long as it doesn’t lead you into sin Acts 5:29) and participating in government. God’s government is not of this world. (Matthew 6:9-10, John 14:30). In fact, from Jesus‘ interaction with Satan in Matthew 4, we see in verses 8-9 that Satan currently is the “ruler of this world” and the “god of this age” (2 Corinthians 4:4). The whole world lies in his power (1 John 5:19, Daniel 10:13, John 12:31). Including this American republic…. Christians are elect exiles in this world (1 Peter 1:17, 1 Peter 2:11), pilgrims (Hebrews 11:13), and ultimately our citizenship resides in heaven (Philippians 3:20). There is no “dual citizenship” in a Christians life. We are not Christians first and Americans second. My agenda and entrustment from the Lord is to preach the gospel (2 Corinthians 5:20, Philippians 1:27, Galatians 6:14, 1 Thess 2:4). The gospel, not politics, is the only hope for this nation. Do you want abortion to end? Proclaim the gospel. Do you want traditional marriage to be upheld? Preach the gospel. Only through changed hearts does a society change morally. Politics and Politicians in America are extremely corrupt. Elections can be bought with the most campaign money. Votes can be bought with earmarks. Unions and big businesses are mostly corrupt to the core and sway elections. We’ve created a political climate where people vote for the politician which “gives them the most free stuff.” Countless campaign promises, always broken. Most times, the best liar gets elected. How can I vote for a person to lead the country whom I never met? Think about this for a second: we don’t know these politicians. Conservative Christian Right. The gravest mistake the evangelical conservative church has made the past 30 years is becoming overly political, I believe. This has created an unnecessary barrier to proclaiming the gospel in America. Christians are not known as those people “who proclaim the gospel and call men to repentance” but rather as the “conservative republican base.” This has had, and will continue to have dire consequences in the American church…. Political affiliation has torn the American church and brothers and sisters in Christ apart in this country. This is an understatement. Think black & white. The American government is supposed to legislate morality and uphold justice (Romans 13:3-4), yet our government through its legislation, programs, and corrupt politicians have legislated immortality at a rampant rate! The electoral college is antiquated and needs to go. Political deadlock. I’m tired of parties foregoing bipartisanship to push there agendas. The corruptness and bias of the media. Left and Right. CONCLUSION: This is where MY conscience has led me and these are some of the thoughts I wanted to share. Thank you for reading, blessings! I could not agree more with some of your reasons! The Church's extreme involvement in politics has been so detrimental to the perceptions people have of us as Christians and an enormous barrier to spreading the Gospel of Christ. We were NOT called to tell the world what we're against. We were called to tell the world about CHRIST and Him crucified, risen, and soon to come. It angers me so much when I encounter classmates in my public university that want nothing to do with Christianity because of politics. They don't have a problem with Jesus, they have a problem with politics. It's heartbreaking. Amen! 2Cor 5:17-20 says we are ambassadors. What is an ambassador? One chosen by the commander in chief to stand in his place in a foreign country, to help the foreign country to come into a relationship with the country where he of from. But he has no voting rights in the foreign country. That is who we are ,as born again christians are in america. Also it says we are given the ministry of reconciliation which is showing Jesus to the lost in this world. I agree with the majority of your points. I think that the best political stance a Christian should take is a-political. Great post! EXCELLENT BLOG! I AGREE WHOLEHEARTEDLY, except I believe the KJV is God's true word. God bless you! I simply cannot agree with this at all. I'm assuming then that if O'Dimwit gets reelected you won't mind watching children (yours(if you have any) and other children) be brain washed into believing the lies by the "useful idiots". I'm appalled that you even think your vote won't count. You keep believing that. Voting is one of the greatest privileges we have in this nation. Use it or lose it. When things go wrong, don't start whining like some 3 year old. You may lose a reader. Rethink what you have said. As a veteran, if you think I will defend you, think again. We as parents, teachers and disciples are in charge of making sure that any "brain-washing" does not take place. As long as we keep the focus on Him and not earthly treasure and selfish desires, then He will take care of the rest, in His will! You can't purposefully jump out in front a bus, and call the outcome an act of God's sovereignty. You can't drop a heavy pot on your toe and call the outcome an act of God's sovereignty. You walk in a puddle of muddy water? Your shoes are going to get dirty. In all of these cases, damage will occur and it's not because God in His sovereignty wanted it to. It's because of foolishness. The children of Israel wanted a king, and God said He had one for them, but no…they wanted Saul, and they wanted him NOW. God didn't hold his sovereignty above their heads, he gave them what they wanted…even though it wasn't His will for Israel. God made us with a free will. Does that mean I won't praise Him if the outcome isn't what I'd like tomorrow? Absolutely, I will. Because while it's true that no matter what happens in this sinful, wretched world I live in, my God is still God and I trust that every need of mine will be supplied. He is faithful. But, I'm still going to vote because it's my God given, American blood bought right as an citizen of this nation. 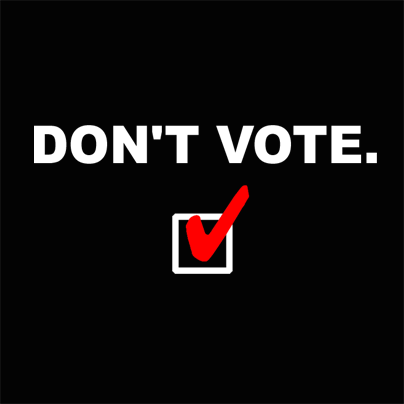 I think this "don't vote 'cause it doesn't count" mentality is the most damaging message to the Christians in our country today. I'm not voting for First Pastor of the United Church of America tomorrow. I'm voting for one of two presidential candidates with the *closest* moral platform to what I believe the Word of God says. Doesn't mean I'll agree with everything, but silence is consent. We have come to the same conclusion & have taken ourselves off of the roles in our community. I have been a bit surprised at the reaction of other christians. Even in our local Mennonite community there is quite the strain of patriotic fervor. While you have every right to not vote and I agree with some of your points, I kind of scratch my head at your "God's will" stance at the beginning of this post. Yes I believe that the outcome will be who God wants to be there for a reason. However, if people followed that mentality and didn't vote because they don't want to vote against God's will, then God's will wouldn't come to play because nobody would vote and nobody would be elected. I have to agree with LeAnna here. This is not a sit back and see what happens sort of situation. First, I am concerned that this is your thinking, and second, I am concerned that you've put this out for many people to read. I have to disagree with your post. Yes, God is sovereign and in control. Completely. But we are not called to watch everything unfold in silence and passivity. If we don't stand up for biblical truths, who will? It is our job as messengers of the Kingdom to bring truth to a nation that is quickly becoming encompassed by lies. Yes, politics are corrupt, and no, neither candidate is Jesus, but like LeAnna said, we aren't voting for a pastor here, we're voting for a president. Someone will lead this country, and you have a say in who that will be. More than than, the freedom to have that say is something that citizens in other countries only dream of. I'm afraid that this hands-off approach is seriously damaging in a world that desperately needs to hear from people who are not full of hot air. Debating politics and discussing current events doesn't have to be cutthroat – it can be an incredible way to challenge, grow, and share our beliefs – beliefs that are hopefully grounded in a Bible that encourages us to be responsible citizens and stand up for the truth. We've pretty much come to the same conclusions. God is sovereign! I couldn't disagree more with this post, and I love this blog! However, your argument biblically is one of silence. You are correct, the Bible doesn't make mention that we should vote, but it also doesn't tell us that we shouldn't vote. And yes, God is sovereign over all things, absolutely true, He will channel the hearts of leaders however He chooses. But to say that since we are Christians we shouldn't vote is somewhat irresponsible. For instance, since God is sovereign in election for salvation, and he is, should I not evangelize? I see our vote as a talent given to us from God, and to not use it is to waste it. Our ability to vote, in my opinion of course, is not a curse, it is a blessing! I personally could never sit idle, with a vote in my hand, and watch our government institute a Romans 1 type of culture, one filled with laws encouraging homosexuality and killing of the unborn. Of course the church and the family unit have a huge role to play in witnessing to a lost world, but part of our witnessing can be exercised in our ability to vote our Christian conscience. Look at the Roman culture in the book of Romans. A sexed crazed culture turned into a homosexual culture which turned into a depraved culture, then God's judgement! Why on earth would we let that happen in our land while we hold one of the very opportunities in our hands to stop it – our vote! Romans 13:1 tells us that all civil authority is ordained by God, completely true, and those in power have been instituted by God. But He established human governments to reward good and to restrain sin in an evil, fallen world. The civil authority in the case of America is put in place by the fact that we as free people vote for that very authority that God has foreordained. Is there a mystery there? Of course! But we are the means by which that authority is put into place, evidenced by the fact that I am an American and the civil rules in place give me the ability to use this great gift – my vote! To not vote because God has ordained it would be like saying God is sovereign over my life, situations and circumstances, so why pray? Beloved, may we not sit on our hands with a God ordained tool by which we can advance biblical principles. The very authority that He has instituted is a free democracy allowing every citizen an opportunity to vote, now use it! Amen. God is sovereign and in complete control. In voting WE are trying to CONTROL the outcome. My family and I believe God has already chosen our next president and that He can use the world to make His will come to pass. He doesn't NEED our vote to do so. Thank you for standing up for what you believe, despite many negative (even angry) reactions that you have already been subjected to, and likely will still be subjected to. Wow. Totally totally disappointed that you and so many CHRISTIANS have decided that their vote is irrelevant and worse, that they think by voting for the best option, they might not be voting "God's will" and therefore would be sinning or some none sensical thought like that. Do you believe the Pilgrims were wrong when they attempted to vocalize dismay in the religious atrocities happening in England? THIS is what drove them to seek refuge in the New World! And believe me, it was much worse in England in that day than it is here in USA. And how do you think it is that we HAVE so many religious freedoms except that it was religious men were involved in politics!! All of the signer of the signers of the Declaration of Independance could equally have said "England is huge. There is no way this little declaration can do any good. They will simply come and destroy us. Pack up, let's go back to England." And their desire is that Christians would CONTINUE to have an Godly influence in the manners of government! As far as having a voice in governing authorities being "unbiblical", it was Paul himself who retained his Roman citizenship, and instead of allowing things to happen "as they may", he chose to "Appeal to Ceasar" so that he could have a greater platform to bring God glory! And your poor choice is EXACTLY why Roe vs. Wade went unchecked. The Church was sleeping, people my parents age were told not to involve themselves in politics and now they are reaping the sad rewards of seeing their daughters and grand-daughters having abortions. What if your vote could save just one baby! Wouldn't it be worth it? Who knows what other shameful atrocities will come about in the next 20 years while you and those you influence choose to shut your mouths outside the walls of Jericho! That is one of the most unintelligent comments I have ever heard in my life. As Christians, we have the job to protect our children and families as best we can. That means voting for the right person, the person that will help keep us on track as a Godly Nation. You know…"one nation, UNDER GOD". Wow, I won't be reading your blog anymore. The ignorance of that statement is unbelievable. I find this an interesting perspective but surely you are then saying that William Wilberforce and the 1000's of Abolitionists were wrong as Christians to spend 40 years in England deeply involved in politics and getting abolitionist politicians elected to pass laws to stop slavery. That would mean you are implying we should have let those slaves continue to be killed and to suffer terribly, continually to be torn from their families, raped by slave masters and to have their rights taken away from them. Not to mention we should not have stopped Child Abuse, Child Labor, Child Prostitution, the superstitious killing of twins in Africa. There are hundreds of similar laws that we can point at. Remember preaching the Gospel alone is not enough. You have to change the laws. Afterall 2 of the most Christian nations in the world had the gospel preached everyday and yet Slavery existed for over 200 years in those nations (USA and UK). This is the natural consequence of your logic. Am I wrong? Even in the Prolife causes, the election of Republicans have resulted in over 500 laws restricting abortions, stopping funding of abortions locally and world wide. Stopping the murder of 23 week old babies by breech delivering them and sucking their brains out while they are still alive. The list goes one. These restrictions reduced abortions by 22 percent. When Obama was elected he overturned whatever he could by Executive order and abortions are now rising again. Who will stand for the innocent? Let's remember to love like Jesus. Alot of comments were very mean & unnecessary. Im sure you yourself have had ur share of "unintelligent" "non sensical" thoughts/ ideas that were not pleasing to God, but He didn't turn His back on you. Let's show the world that we can disagree lovingly because we are followers of Christ. I don't completely agree w/ her statement but she does have freedom of speech. So instead of bashing let's pray for one another. As a father, I will Vote everytime the doors open. It is the system that people have fought and died to create, the system that people have died to become a part of. Regardless of your political affiliation the freedoms that our system affords us…..are the freedoms that allow our country to be a beacon of hope for people around the world. I agree with many of your observations, but i do not believe that giving up your vote will benefit any of our children. Vote, it's a blessing provide to us by a greater power. It's part of his plan……and he placed you in the U.S. to be part of it. I don't think most of these comments were mean…they were simply expressing their right of free speech by saying why they don't agree. The "unintelligent" comment was kinda harsh. But for the majority, they were just expressing why they would vote. I'll be voting…I believe that I have no right to complain about the things that are wrong if I don't try to change it. But you're right…we all need to pray. I think your heart is in the right place, but you're working with some dreadful misinformation. Let's start with your definition of "sovereign". Psalm 62:11 (this verse was your choice, not mine) says, "Once God has spoken; Twice I have heard this: That power belongs to God." The Hebrew word used for power in this instance is "oz", which means power, might, or strength. It does not imply total dominion….which brings me to my next point. Genesis 1:26 Then God said, "Let us make man in our image, in our likeness, and let them rule over the fish of the sea and the birds of the air, over the livestock, over all the earth, and over all the creatures that move along the ground." See also Psalm 8:3-8, in particular verse 6, which says (about man), "You made him ruler over the works of your hands; you put everything under his feet…"
God gave MAN dominion over the earth and everything on it. At no point in the bible does he ever REVOKE this authority. Yes, God is sovereign (all-powerful), BUT he gave US free will, the very authority to disobey him. Oh, and how we do! This is where the argument about "God is sovereign, so what I do doesn't really matter, because his will is done anyway" falls apart, quickly. How does this apply to other things? If a man rapes a child, should we stand back idly and let him roam free, because he's just carrying out God's will? How about murder? Is that also God's will? Logic defies this argument! All these people on Earth, every one of us, disobeying God's own law day in and day out? Can you truly believe that is his will being carried out? The idea is laughable! I say all this not to insult, but to inform. It concerns me greatly that you are spreading these ideas to others who rely on your judgement as a follower of Christ. One more thing: to those who opt to just "stay out of politics"….how cozy is it that you have that option, on the backs of those who, thankfully, didn't feel that way? I agree with your blog post on voting. Back in 1992 I was able to vote for the first time. We had dinner at 5 and turned on the news before we were to leave to vote. Much to my surprise, the media said that Bill Clinton had already won. I could not believe what I heard. We went and voted anyway, somehow thinking we would be enough to somehow change the winner, but to no avail. This was my first experience in voting and finding out that it didn't matter. Four years later when it was time to vote again, and after all the trouble President Clinton had supposedly caused himself, even almost being impeached, he got re elected. I say this to everyone. My vote didn't matter then and doesn't matter now. Which is why I haven't voted since. God said he would never leave or forsake his children and that is where my vote goes. Not to any human. There are three life boats. The first is empty, the second has 10 people in it and the third one has 100 people in it. All of them are sinking and doomed to go under. Obviously the highest priority is to save the one with 100 people and yet only the first two boats are within reach to save in time before they are completely submerged and lost forever. So what should we do? We could of course go save the empty life boat, but that is completely contrary to purpose of saving innocent lives. We could hold on to the idealism that it is better to try to save the 100 even though at this juncture, and with the situation we find ourselves in, there is no reasonable way to do so. Furthermore, in doing so, the 10 will also die because we held on to our ideals about what is best as more valuable than life itself. Finally, we could make the decision to save as many as possible with the situation we are given. Voting for Obama is like saving the empty boat (completely purposeless when it comes to the cause of saving lives because Obama is without question the most pro-abortion President in American History), voting for a third party candidate is like trying to save the third boat (which might be a more ideal candidate but they have no chance of winning) which forfeits saving any lives and essentially is as good as saving the empty boat (voting for Obama). Not voting at all is simply to sit back and watch all three boats sink and to do nothing at all about it (which is reprehensible). The only rational and, indeed, the morally obligatory duty here is to save whom we realistically can by going for boat number 2 (voting for Romney). It is certainly not ideal but it is the best move we can make given the situation we find ourselves in. Perhaps after this horrible event we might strive to make sure we don't find ourselves in the same situation again, but that is another matter to be dealt with after the present situation. Thank you for posting prior to me having to. We are citizens of heaven but also of the US. We cannot forego our responsibilities to either. We might as well adopt the slogan "ensha alla" spelling? (if it is God's will) which muslims use as a reason for in action. This thinking is poisonous and regardless how you spin it… Saying it is just your opinion on a public forum encourages others in this way. If Christians dont vote with moral vector then no on will. because of this blog, I decided to unsubscribe to this blog. Apparently, you really are not raising Godly children. 1. Yes, God is sovereign. He created everything that exist and is in ultimate control, but that does not mean EVERYTHING is predetermined. If that was true then people would have no free will and could not choose to accept Jesus as their savior. It would mean that God picks and chooses who becomes saved. 2.True, there is no commandment to vote. Likewise there is no commandment not to vote. 3.I found this particularly funny. The third point say that satan rules the world and is in charge of the worldly governments. This is total contradiction to point #1 which stated that God is sovereign and in control. Satan can only control that which God allows him, and he cannot control our decisions. He can tempt, but in the end all choices we make are out own. 4.Correct that Christians are foremost citizens of heaven, incorrect that we are not a part of the world as well. God put us in the world for a reason. If there was no reason for us to be here then God would just bring us all home. We do need to be Christian first, as God is the most important, but if you are an American shouldn't you do your part to bring God into the country and make this a Godly nation? 5.I completely agree that only God can change the heart of the nation, but as I have said we are in charge of our own choices. Preaching the gospel can change hearts, but only voting can change laws. "Do you want abortion to end? Proclaim the gospel. Do you want traditional marriage to be upheld? Preach the gospel." Let me add to that. Want abortion to end? Proclaim the gospel AND vote. Want traditional marriage upheld? Proclaim the gospel AND vote. Vote or don't vote. Neither action affects your salvation. I would just say that as a Christian you should make Jesus a part of the voting process. Look to His word for guidance. Go to Him in prayer, and vote to bring honor Him. As with everything else in life, choose your actions to bring glory to the Lord. Sometimes that might be not voting at all or finding an alternative to vote for, just trust in God for guidance. "Beloved, may we not sit on our hands with a God ordained tool by which we can advance biblical principles. "~loved this comment. And, I disagree with this 'no-vote' idea and for all the reasons listed above in the comments left by people who do not agree as well. Will pray for you to reconsider this idea. Also, very encouraged by all who exercise their right to vote and praising God for each of you!! This is a tough one and there are so many good points in these comments. In the end however I think it comes down to my Christian brothers and sisters who serve and have served in our United States Military. I'd be naive to think that there are 0 believers enlisted. So in that I believe the absolute least I can do for them is vote. With that said I do agree with everything else. We ultimately are a separate nation, called out under the leadership of Jesus Christ. He's in full control. There is no other medicine for the human soul then the Gospel, and the Gospel alone. No substitutes. All nations are ultimately against God, and our nation is far from being Christian. But sometimes the world needs to see that we are good stewards to what God has given us. The act of being fiscally and socially responsible is as much of a witness sometimes then my words. My vote is not a vote to say I believe that the future president should be the Pastor of the United States, but rather help create policy in which our Pastors can preach without the fear of government involvement or persecution AT THE SAME TIME tackle some of our fiscal responsibilities as a nation. 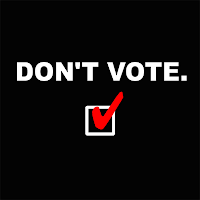 I must say that though you have a God given right not to vote…I do not see how not voting is advancing the Kingdom. Thank you so much for your post brother and I so appreciate your passion for the Gospel!!!!! I definitely understand what you are saying. Although, I have to say we are still responsible to vote our conviction. Just as God is our provider, yet men still are called to work. Just as God is our protector, yet we still have and need military. And that's clear in the Bible. Take a look at the article below. Thank you for all you do for His glory.